Much of the boys time at home is taken up by building, which as you can probably tell from many of the posts written, i love. Don't get me wrong I'm an action figure geek and i love a good Batman battle with Seth's figures but the variety of play that you get with Lego really cant be beat. The idea of having a toy that lets you just think of anything and then build it is genius and its obvious why Lego are such a HUGE company. It's unsafe to leave Opeie playing with Lego alone because of the small parts, he's still into trying to put everything he finds in his mouth so the fact that Lego also make Duplo for younger children is great. We can happily leave Opeie playing alone briefly and not have to worry about him choking or getting pieces stuck up his nose etc. Also i think its great that you can use these on the large Lego base plates to build on. Its not just Lego that we use in the house for our building, there's lots of different building materials for kids on the market these days. 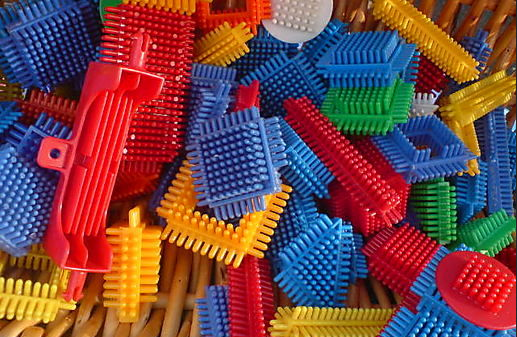 When i was younger i loved my Lego but i was also a big fan of Stickle bricks which i used to play with when having a break from the Lego. While in TK Maxx last week when i wrote my post about Seth wanting to buy a present for Opeie to say sorry for busting his ball we also spotted these which i had to buy to try out as they reminded me of the Stickle bricks, their made by Fisher Price and their called Clipo. They are also great for Opeie to play with as the parts are large and the colours are great. If anyone reading this knows of any other interesting building materials for children like this then please let me know. were always on the lookout for new things to try. Ive been meaning to try and get a picture of some interesting building pieces that Seth uses at school so if do i will add them to this post i have no idea what their called. 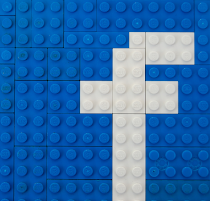 Lego will always be our main building material due to the versatility of it and you can be sure to see many more posts about the things that we have built. My little bloke loves the Clipo 'bricks' too, it's understandable 'cos they are so tactile. BUT both kids are obsessed by my Star Wars Lego, raising tiny geeks and Lego lovers is the best isn't it?! Lego is fab isn't it. most the lego we have used to be daddy's when he was a child and it got saved in the loft by granny and grandad. Most of it has stayed perfect to use even after all these years (although it did need a good wash). What are those uni blok things called - is that the thing they use at school? Can't remember the name of them now.